There are two main approaches to management - plan it or wing it! Both have their enthusiastic practitioners and both sometimes produce good results. However, there are reasons to think that one of these approaches is better than the other. 'Winging it' originated in the theatre meaning an actor who read their lines in the wing without any other preparation and then relied on prompts, again from the wings, to get them through. The advantage to this is the time saved on preparation but the disadvantages can be a high rate of mistakes and show a lack of learning - these same mistakes are likely to be made again and again. Those disadvantages outweigh advantages when economics or regulations make it important to get things right first time or when steady improvement to an operation can be made over time. Both of these apply in farming so planning is the best option to improve results and reduce risk. Good planning depends on having clear, organised information and the experience to understand how to use it - assess trends, spot potential problems and take action. 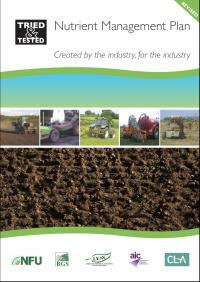 There is no shortage of methods and tools for generating information (soil analysis, tissue testing, manure analysis and so on) or for recording and organising it using computers (PLANET, MANNER-NPK, commercial software packages) or paper-based systems (Tried & Tested Nutrient Management Plan and Feed Management Plan). It's use of these that's a bit patchy. The Defra Farm Practices Survey in 2015 showed some uptake of the different components of nutrient management planning. There's a lot of detail but one thing is clear: larger farms (equivalent of three or more full time workers), and especially arable farms, plan their operations the most. The larger farms were also more likely to report regular soil testing, manure analysis and completion of manure and nutrient management plans. They do seem to be rather good at gathering and organising information on their operations. There's a chicken and egg issue here - do large farms spend more time and effort on planning because they have the resources or does investment in information and planning lead to farm growth? It's probably a bit of both but it would do no harm if ways could be found to allow smaller farms to make better use of information. It should be possible to do this. The Farm Practices Survey found use of the Tried & Tested paper-based 'Nutrient Management Plan' was reported by 18% of both large and small farms. This plan was designed for ease of completion and avoidance of non-essential bells and whistles. 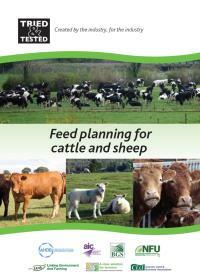 The Tried & Tested 'Feed Planning for Cattle and Sheep' follows the same principles. This approach seems suited to farms where management time must compete with farm work because the same people do both. The other part of planning is the experience needed to make good use of information. Farm advisers and crop consultants have always played a strong role here but there is a trend for farmers and farm managers to develop their own skills. Increasing numbers of them are now gaining FACTS certification, something that can benefit all farms, large and small.